Sometimes I cheat at being literate. Certain tomes are just too dense for me, so I find alternative ways to digest them. 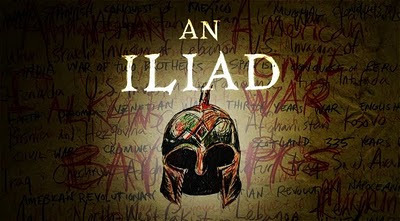 That's why I was happy to recently see Portland Center Stage's production An Iliad (on stage through November 21). I could finally enjoy the story of The Iliad without stopping every page or two, squinting and mumbling to keep the names straight. Because, I'm sorry to say, I love the stories but have a hard time following the multisyllabic monikers and places from which they hail. I forget which maidens have been stolen from which conquests, and which gods are creating alliances with which other gods, who are all lackadaisically sticking a toe in to interfere now and then. I was surprised to discover that this was a one-man show, and Joseph Graves was impressive in his range of voices and personalities. I am always amazed when one person can create for the audience images which keep our rapt attention. The heated battle scenes, especially, obscured the fact that I was watching a single actor, not two, or seven. Graves portrayed the storyteller, a scruffy wanderer who needs a shave and a good meal, but is haunted by the need to sing and to tell his tales. Meanwhile, the gods look on mercilessly, with only a rare sign of inspiration or help. I'm not going to recount the stories because I will still probably get the names and places mixed up (Achilles! Mount Olympus! Hector! Troy! Prium!) but the impressions will stay with me and deepen the magic. These are stories of rage and pain and war. The grief is so real, such as when Achilles and Prium, enemies, weep together, as fathers for sons and sons for fathers. And you feel the impact in moments like this: the storyteller recites the names of wars, one after another - five, ten. His voice is weighted with the meaninglessness behind each war - thirteen, fourteen - the death and destruction, the hopelessness. He continues his list - thirty, thirty-eight, forty. He staggers to his chair, reciting. Fifty now, seventy-three, ninety. There is utter weariness in his face, naming wars, more wars, from every epoch all over the globe. You feel the list will never end. And then it strikes you with horror: indeed, it won't. I was especially captivated by the idea of the storyteller, and enjoyed Trisha Mead's essay "In Search of The Poet," where she explores the idea of the author, Homer, whom no one has been able to pin down in actual history. I would have loved if the script itself held more backstory about the storyteller, who drifts in from nowhere and is clearly plagued by what he has seen. Always, the unanswered questions hold for me the most delight - I want the writer to pursue them. Because a writer is not allowed to cheat. A reader, always. And some stories need to be told over and over again, no matter how they break our hearts.